Coombs test is also known as antiglobulin test. The Coombs test tests for antibodies that may stick to the red blood cells and cause red blood cells to die too early. It was discovered by Coombs, Mourant and Race in 1945. Coombs reagent is antihuman globulin. It is made by injecting human globulin into animals, which produce polyclonal antibodies specific for human immunoglobulins and human complement system factors. Red cells coated with complement or IgG antibodies do not agglutinate directly when centrifuged. These cells are said to be sensitized with IgG or complement. In order for agglutination to occur an additional antibody, which reacts with the Fc portion of the IgG antibody, or with the C3b or C3d component of complement, must be added to the system. This will form a “bridge” between the antibodies or complement coating the red cells, causing agglutination. The direct Coombs test is used to detect antibodies (IgG or C3) that are stuck to the surface of red blood cells. Many diseases and drugs can cause this. These antibodies sometimes destroy red blood cells and cause anemia. This is the test that is done on the newborn’s blood sample, usually in the setting of a newborn with jaundice. The two most commonly recognized forms of antibody-mediated hemolysis in newborns are Rh incompatibility and ABO incompatibility. Prepare a 5 % suspension in isotonic saline of the red blood cells to be tested. With clean pipette add one drop of the prepared cell suspension to a small tube. Wash three times with normal saline to remove all the traces of serum. Decant completely after the last washing. Add two drops of Anti-human serum. Mix well and centrifuge for one minute at 1500 RPM. Resuspend the cells by gentle agitation and examine macroscopically and microscopically for agglutination. 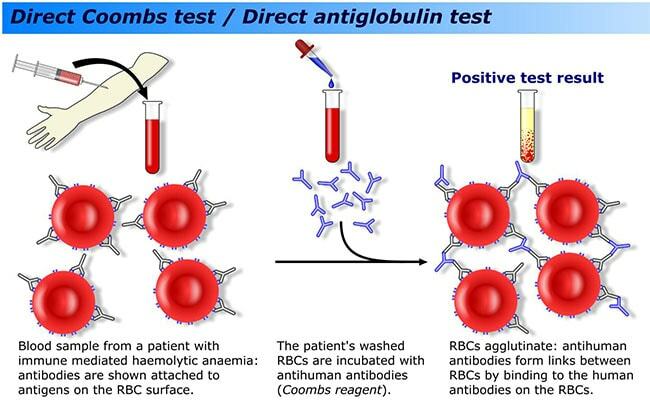 The indirect Coombs test looks for free-flowing antibodies against certain red blood cells. It is most often done to determine if you may have a reaction to a blood transfusion. This is the test that is done on the mother’s blood sample as part of her prenatal labs. Frequently referred to as the “antibody screen”, this test identifies a long list of minor antigens that could either cause problems in the newborns or cause problems in the mother if transfusion is necessary. Approximately 5% of patients have a positive IAT due to IgG antibodies, IgM antibodies, or both. Label three test tubes as T (test serum) PC (Positive control) and NC (negative control). In the tube labeled as T (Test), take 2 drops of test serum. In the test tube labeled as PC (Positive control), take 1 drop of anti D serum. In the test tube labeled as NC (Negative control), take 1 drop of normal saline. Add one drop of 5 % saline suspension of the pooled ‘O’ Rho (D) positive cells in each tube. Incubate all the three tubes for one hour at 37°C. Wash the cells three times in normal saline to remove excess serum with no free antibodies, (in the case of inadequate washings of the red cells, negative results may be obtained). Add two drops of Coombs serum (anti human serum) to each tube. Keep for 5 minutes and then centrifuge at 1,500 RPM for one minute. Resuspend the cells and examine macroscopically as well as microscopically. No clumping of cells (no agglutination). This means you have no antibodies to red blood cells. Transfusion reaction, such as one due to improperly matched units of blood. Great presentation. I used to work in the blood bank as a medical technologist performing DAT and IDAT testing. This presentation is simple and to the point. This was a good review for me. sir, actually in coombs test there is a negative result means? pls clear my doubt. @Sandy. A negative result means that the complement was not fixed to prevent agglutination. It equally implies that the antibodies (Ab) were not sensitized. ICT:Three tubes T,NC,PC In tube T:pt serum+O pooled cells. Tube NC:O Dneg cells+ anti D antisera 1/5 diluted. Tube PC:O Dpos cells+ anti D antisera 1/5 diluted. in ict there was error in procedure.no human serum was used.so which blood do we use to test for cell sensitization in vitro.but good notes in DCT. i didn’t recognise the third tube. We have developed a new Superagglutination test for serodiagnosis of infectious diseases. It differs from conventional plate/slide agglutination tests (PAT/SAT) by three additional steps: prior staining of serum antibody by adding a dye and addition of diluted biotinylated antiglobulin and avidin in sequence after mixing the antigen with the test serum. The new steps circumvent the problems of false positive and false negative results of PAT/SAT. In serodiagnosis of brucellosis, Superagglutination test had higher positive predictive value and specificity than Rose Bengal Plate Test (RBPT) and Standard Tube Agglutination Test (STAT) and higher negative predictive value and sensitivity than RBPT, STAT, ELISA and Complement Fixation Test (CFT). It has been several years since I have worked in BB is there now a completely automated way to do a Coombs test? A more general question can a cross match NOW be done by machine….or is it still the familiar labor intensive procedure I am familiar with?